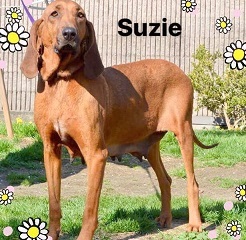 SUZIE is a soulful Redbone Coonhound from a Kentucky shelter, only 4 years old. She looks as if she’s had several litters. She needed to have her spay redone when she got to Last Hope because the stitches opened up. She is a LOVE like the dog characters in the classic- Where the Red Fern Grows . Unlike the dog characters in the book, SUZIE needs a “happily ever after”.